A witch riding around on a broomstick crashes into a factory chimney and breaks her broom. Fortunately, the factory happens to be a broom factory, so she takes it in to get a new handle. Woody is working the night shift, and kindly makes a new handle for the broom. However, he insists that the witch pay him 50 cents for the broom, and will not allow her to have it until she does so. 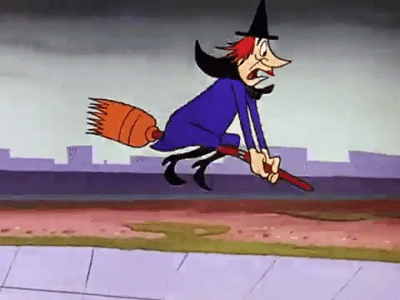 This prompts the witch to invent numerous schemes to get the broom back, all of which fail (and usually do no more than earn another reminder from Woody to pay the 50 cents).Eventually, she relents and pays Woody a 50-cent coin. Woody lets her into the broom vault, and she discovers it is stacked with brooms, none of which respond to the words And away we go! (which are the words to make the broom fly). Woody, laughing, mimics her words, unknowingly holding onto the enchanted broom, which launches him out the open window.